Our God is One, but manifested in three persons; The Father, The Son, and The Holy Spirit (Philippians 2:6; St. Matthew 3:16-17). Man's first step toward salvation is Godly sorrow that worketh repentance. The new birth is necessary to all men, and when it is fulfilled, it produces eternal life (II Corinthians 7:10; I John 5:12; St. John 3:3-5). Baptism in water is by emersion and is a direct commandment of our Lord. It is for Believers only. This ordinance is a symbol of the Christians identification with Christ in his death, burial and resurrection (St. Matthew 28:19; Romans 6:4; Colossians 2:12; Acts 8:36-39). The following recommendation regarding the Water Baptismal formula is adopted: "On the confession of your faith in the name of the Father, Son and Holy Ghost and in Jesus Name. Amen." The baptism in the Holy Ghost with fire is a gift from God as promised by the Lord Jesus Christ to those who are believers in this to the new birth. This experience is accompanied by the initial evidence of speaking in other tongues as the Holy Spirit Himself gives utterance (St. Matthew 3:11; St. John 14:16-17; Acts 1:8; Acts 2:38-39; Acts 19:1-7; Acts 2:4). The Bible teaches that without holiness no man can see the Lord. We believe in the doctrine of sanctification as a definite progressive work of grace which commences at the time of regeneration and continues until the consummation of salvation (Hebrews 12:14; I Thessalonians 5:23; II Peter 3:18; II Corinthians 3:18; Philippians 3:12-14; I Corinthians 1:30). Healing is for the physical illness of the human body and is wrought by the power of God through the prayer of faith and by laying on of hands. It is provided for by the atonement of Christ and is the privilege of every member of the Church today (St. Mark 16:18; James 5:14-20; I Peter 2:24; St. Matthew 8:17; Isaiah 53:45). The angels said, "This same Jesus shall so come in like manner" (Acts 1:11). His coming is imminent. When He comes, "The dead in Christ shall rise first: Then we which are alive and remain shall be caught up together with them in the clouds, to meet the Lord in the air" (I Thessalonians 4:16-17). Following the tribulation He shall return to earth as King of kings and Lord of lords together with His Saints who shall be kings and priests. He shall then reign a thousand years (Revelation 20:6). The one who physically dies in his sins without Christ is hopelessly and eternally lost in the lake of fire and has no further opportunity of hearing the gospel or for repentance. The lake of fire is literal. The terms eternal and everlasting used in describing the duration of the punishment of the damned in the lake of fire carries the same thought and meaning as endless existence as used in noting the duration of joy and ecstasy of the Saints in the presence of God (Hebrews 9:27; Revelation 19:20; Hebrews 6:1-2). 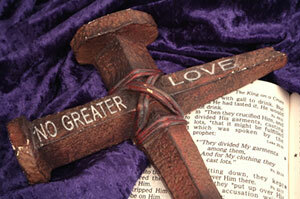 Until He comes, we partake of the Lord's Supper to illustrate the Lord's death (I Corinthians 11:23-31). 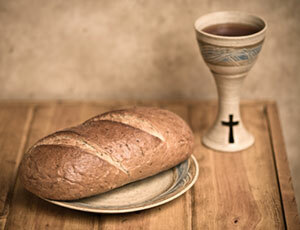 The bread symbolizes the Lord's broken body (Isaiah 53:5; I Corinthians 11:24). The cup represents the new covenant of His blood which provides us with forgiveness and relationship with God (Hebrews 9; I Corinthians 11:25). Christians realize that salvation is provided through the Finished work of Christ and these sacraments are symbolic of His finished work. I Corinthians 11:27 then says that if anyone takes of these sacraments unworthily he is guilty of the body and blood of the Lord. This is a simple belief that God's power and anointing, or any other necessary quality can be transmitted by one person touching another. Laying on of hands was practiced by the Levitical Priesthood. Jesus practiced it in St. Mark 10:13-16 as a blessing. This is our procedure for baby dedications instead of baptism. We also practice laying on of hands for healing (St. Mark 5; Acts 28:8; Acts 19:11-12); to confer office (Acts 6:26); to receive the Holy Ghost (Acts 8:16-18); to believe words spoken, to receive and cultivate the anointing; for ordination to consecrate and receive the necessary ministry tools (I Timothy 4:14).